So erm, where do I start… WOW!! Disneyland for adults?? Las Vegas was IN.SANE and for so many reasons… Jaw dropping, stunning, crazy, mind blowing, exhausting!!! After leaving the flashing lights, crowds and endless cocktails 4 days ago, I feel I can finally get my head 'round the place that is quite possibly, the most surreal street I've ever been on!! Before I flew out I'd had so many recommendations, bits of advice and all that - Most I followed but also, bust some boundaries of my own…. The next two posts will cover the obvious holiday outfits, shopping and then some of my own (and stolen) recommendations for when you hit up Vegas. Standard travel clothes apply… Layers, loose and a huge bag! The whole outfit is 6 months+ so no links to buy on this little lot, apart from the gorge new wooden bracelet sent from Lulu Winter a couple of weeks ago! This is one of those bracelets you'll have for years!! Wooden, gold plated and a gorgeous green stone - total outfit changer! Buy here. It doesn't matter how you're travelling… If there's a bloody technical fault with the plane you can't do diddly… Apart from shop!!! Please welcome the first purchase of the trip, the new Mango palm print cami making it's first appearance in a Gatwick changing room selfie - buy it here. After nearly 24 hours we finally arrived at The Bellagio…. I'm not sure where to start with this..The physical size of the hotels in Vegas are unimaginable…Totally crazy! This is the reception area at The Bellagio, behind me was a very minimal Hermes store and to my left was a sea of people constantly streaming in through the revolving doors…In short, the whole ground floor was an enormous mall rammed full of high end boutiques, bars, clubs, restaurants and casinos oh and, a huge botanical garden and conservatory area with its own butterfly house…'course there was…IN.SANE! The view from the jacuzzi bath! So apparently it's not unusual to be cheeky and ask for a FREE upgrade at Vegas hotels (so un-British)… I had kinda' worked through what I was gonna' say a million times and then when it came to it, I just asked and KABOOM - FREE UPGRADE TO A JUNIOR SUITE MADAM?…HELL YEAH! Basically, we had a corner room, double aspect… Out of one window was the mountains and the other, Caesars Palace! Despite me having a mini meltdown early SS14 about holiday wear and "Can I really still wear shorts at my age…?!" thoughts, I seem to have come out the other side and decided to embrace (for maybe just one more year…)! Chosen by my mother as we sifted through the racks in Zara a couple of weeks ago… High waisted, high summer ready, versatile and totally not suitable for bending over!! Short - Zara new season. Oddly, I can't see them online.. Def in store though! Sandals - Zara last summer. 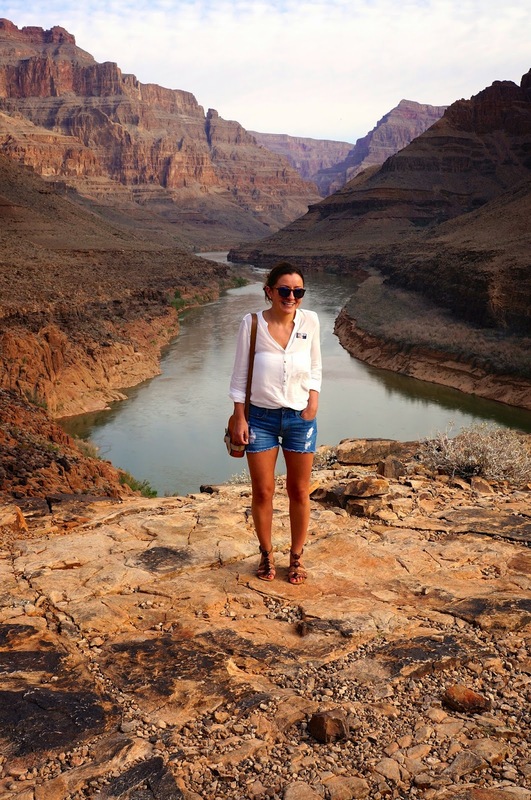 Cami - New Look last summer….less than a tenner and couldn't live without it! Bracelets - Banana Republic last summer too. Clutch - J.Crew…. This is new, purchased in Vegas at the outlet. Confession… For some reason I was pulling a stupid face on every shot, even on the photo taken on my phone below, hence I have beheaded myself! Shorts - Zara new season - buy here. Crop Top - ASOS new season - buy here. Corset heels - Them Zara ones from last year, oh how I still love them! Clutch - My favourite Michael Kors Selma - sold out! Dinner… If you choose one place to eat out then you have to eat at 'yellowtail' @ The Bellagio!! It's a Japanese taste sensation… Seriously, one of the best meals I have EVER eaten!! To top it off, if you book a table outside then you get to watch the famous Bellagio fountains at night with front row seats!! Orrrrr, you can get in a helicopter and fly out to it from Boulder City Airport! We flew with Papillon Air who also include hotel transfers too and more importantly, breakfast and champagne at your landing point in the Canyon!! This little excursion was a major highlight of the trip (closely behind the outlet mall…)..It's pretty much a once in a lifetime gig so you must go if you visit! If you are seriously (crazy) brave, then the Sky Walk 'sounds' amazing… This is basically walking out on a clear platform above the Canyon.. No thanks. Thanks for asking…! Denim shorts - H&M last summer… They have loads, everywhere! White shirt - Zara at some point last year… it's one of their standard basic white shirts - buy here. Sandals - V.V. Old from Nine West! Bag - Ted Baker…a couple of years old at least! Shorts - As before Sandals - The fabulous and seriously comfy Pull & Bear ones featured here (with buy links). Vest - French Connection. This is new, striped perfection, has a slight racer cut to it. Buy here. Sunglasses - Michael Kors. Vegas Advise #4 - The Dam Dam..
That's me done with 'Part 1'…Do you agree with my Vegas advice? Do you wanna' go? What's your advice? What do you think of my buys? What shorts are you buying? So many questions - tell me! I want to go back already!! Wow, a wedding at the Canyon, WOW!!! You look seriously amazing in those yellow shorts! Vegas looks amazing i want to go back after seeing your pics. Thank you!!! That's so lovely! 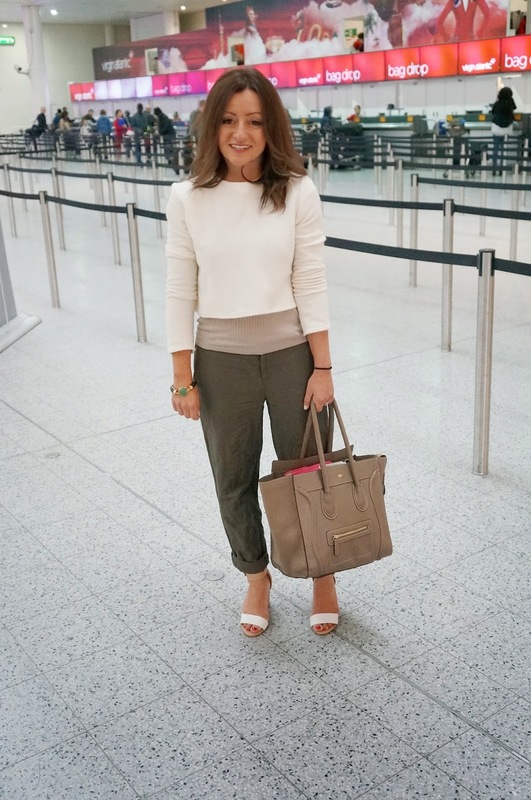 Your airport outfit was on point (I just bought some khakis....when you mentioned them to me I just thought...gotta have!). And...OMG....your room looks sicccck. Well played for just straight up asking! Thanks sweets and I'm glad you enjoyed it!! Thanks for the shorts love! !